I am a mommy of two sweet, adventurous, loud and crazy little girls. I'm currently going through a divorce. The most difficult and stressful time in my life has turned out to be the most exciting and happy time as well. I'm learning as I go. My independent firecracker! This is my 3yr old ball of energy! She starts bouncing off the walls as soon as she wakes up in the mornings. She is super smart and remembers everything. She also has the biggest heart and cares about everyone and everything! My Little Lovey! This is my precious 1 year old baby girl!! 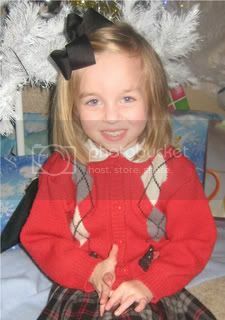 She is such an amazing little girl with a huge personality. She is independent, opinionated, and oh so brave! 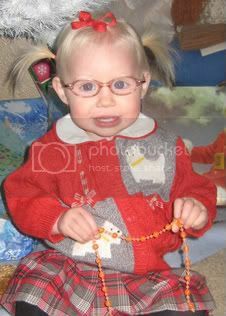 She was born with Oculocutaneous Albinism and vision problems, but she has not let that stopped her a bit. She is very curious and doesn't let anything get in her way. I only have two things on my mind.. I'M SICK!!!!! Ugh. That's about all I can think right now. The entire right side of my face is swolen and in pain because I have a massive sinus infection. Ugh! I've been through almost a whole roll of toilet paper from blowing my nose. Ugh!! I'm starting to feel achy and pray that i'm not getting a fever..or the flu. Ugh!!! Care Bear's birthday party is Saturday and my house is a disaster! C has been working late every night and I have no idea how we're going to pull it all together. I'm just laying here today. Not.Doing.a.Thing!! Oh yes, and Leah gave me a Blog Award a few days ago. Yall know how awful I am about getting these up, but i'm excited because it's my first one on this new blog! 1) Present this award to 7 others whose blogs I find brilliant in content and/or design, or those who have encouraged me. 2) Tell those 7 people they've been awarded HONEST SCRAP and inform them of these guidelines in receiving. 3) Share "10 Honest Things" about myself. Hmm.. 7 of my favorite blogs. Yall don't have to post this on your blog, but i'm awarding you anway. Ten Honest Things about Me..
1. I just read Breaking Dawn in two days. I freakin' loved it and now I don't know what to do with myself. 2. I hate Halloween. It's not a big deal to me and i'd rather sit home and do nothing on that night. We still have not gotten Care Bear a costume..oops! 3. My favorite thing right now is Matrix Amplify Shampoo and Conditioner!! It's amazing. Pricey, but amazing. 4. I have an issue with technology. It seems that everytime I get some new cool gadget, it breaks within no time! I had a Zune..it quit working when it was sitting next to my cell phone. I've broken about 3 cameras, NICE cameras! Cell phones, forgetaboutit.. I lose them, drop them in water, etc.. Brand new printer, hooked it up and something went wrong and it started making some awful noise! No clue why?! 5. I'm to sick to think. How bout I just do four and maybe I can think of more later.. I'm grouchy!! I'll say a prayer you feel better soon!! There is 5th book (well she never finished it because it was "leaked") that Stephanie Meyer (Twilight Author) wrote that was from Edwards point of view. You can go to her website to view it but can not print it out. It is about 240 pages? If you want a printable version, let me know and I can e-mail it to you. Aww, thanks Kaycee. And, I didn't know you hated Halloween. That is seriously my favorite holiday and time of year! 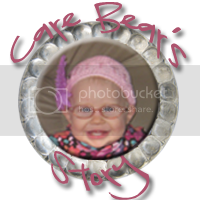 I hope you feel better, I am sure somehow you will pull things together for Carrah's party by Saturday! I hope you feel better soon. happy belated Birthday Carrah. She is so cute can't believe she is one!